Hennebery Eddy Gives | Hennebery Eddy Architects, Inc.
We believe community action is paramount to a successful, holistic architectural practice. Each year, Hennebery Eddy matches donations made by individual employees to one 501(c)(3) charitable organization of their choice, dollar-for-dollar up to $150. In addition, we support a variety of community and professional organizations through monetary donations on behalf of the entire firm, sponsorships, and in-kind donations. In the past, these have included the John Yeon Center, Mercy Corps, Friends of the Children, Habitat for Humanity, Portland Winter Light Festival, Portland Design Events, Oregon Rail Heritage Foundation, Portland Children’s Museum, and several local schools. Volunteering provides net-positive benefits to both the affected communities and the participating individuals, and staff at every level are involved in volunteering their work time. In 2017, we totaled more than 1,000 volunteer hours. Several staff fulfill leadership positions on civic commissions and professional industry groups, including the Portland and Gresham Design Commissions, Regional Arts and Culture Council, and Portland Historic Landmarks Commission; local chapters of the AIA, Design-Build Institute of America, and Construction Specifications Institute; and the boards of nonprofits like the Architecture Foundation of Oregon and Northwest Earth Institute. Staff further provide their passion and expertise by supporting university architecture programs through advisory council positions, adjunct teaching positions, visiting critiques, office visits, and internships. We also volunteer annually with the Architecture Foundation of Oregon’s Architects in Schools program and the ACE (Architecture/Construction/Engineering) Mentor Program, sharing our passion with K-12 students. 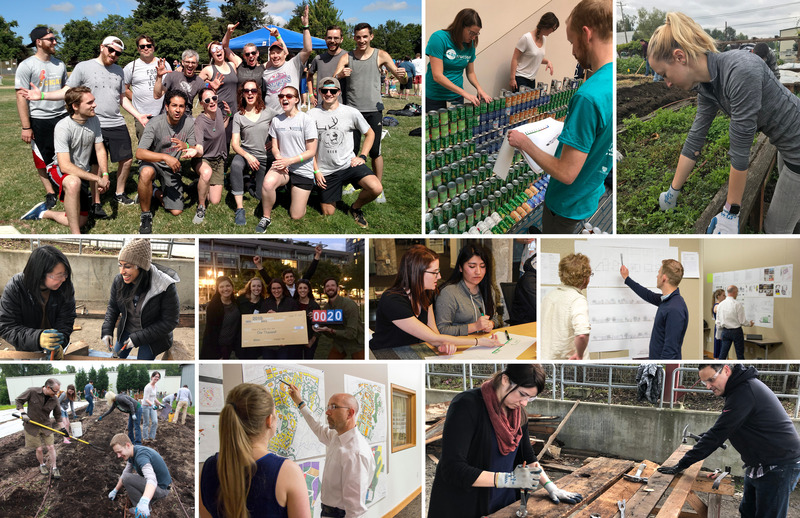 Through an ongoing partnership with the Oregon Food Bank, staff participate in an annual volunteer event to tend the OFB Learning Garden and harvest food for the bank; we also hold in-office food drives and have participated in the CANstruction challenge. On the annual Martin Luther King, Jr., “Day of Service” in January, staff may use the work day to perform community service of their choice while being compensated for their time. And our annual service scholarship allows a staff member to use the time, resources, and financial support of the firm for a community project of their choice. Hennebery Eddy strives to make a significant, positive impact on our region’s built environment while serving as good stewards of the profession as well as our community. We are a signatory to Public Architecture’s 1+ program, which challenges architecture and design firms across the globe to make a pledge of 1% or more of annual billable hours to pro bono service. Our current pro bono project brings together community, business, design, and construction leaders to address a failing park in downtown Portland. Read more about the O’Bryant Square Vision.